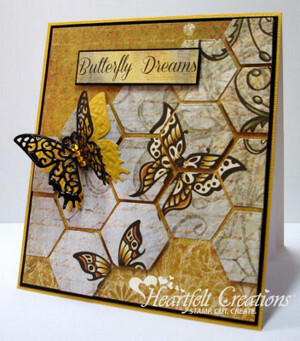 The Butterfly Dreams Card is a simple and gorgeous handmade card. The glorious golden face of the card is decorated with fluttering butterflies and is sure to set you dreaming. The hexagonal honeycomb pattern that runs diagonally across the card accents the honey color of the background. The single stand-out butterfly adds dimension to the card. Soon, we will be missing all the beautiful butterflies that surround us during the summer, which makes this a perfect card to cheer up a friend or say hello. If you are looking for handmade card ideas for fall, this is it. The card size is 13cm x 15cm (5" x 5 7/8"). Create a blank card from white card stock. Select the paper shown from the collection and cut to size: 12cm x 14cm (4 3/4" x 5 1/2"). Choose a section of paper and begin to die cut the hexagonal shapes. Die cut them next to each other so the pattern can be pieced together. Arrange and adhere the pieces to the paper using double sided tape on some and foam pads on others. Trim off any pieces that overlap the edges. Mat them onto some black and then yellow card stock. Adhere this to the blank card. Cut the sentiment from the paper collection. Trim and mat onto black card stock. Adhere to the card using foam pads. Die cut the butterflies from yellow and black card stock. Adhere in the centre with glue and add the gems. Adhere the butterflies to the card to complete. This butterfly dreams card is unique and edgy! It's really a fun style! I like the antiqued puzzle-pieced look. It seems both of those looks would be easy to pull off with available materials. The color scheme is a nice contrast between the yellow and black with shades of gray and gold too. The card also has a lot of depth and movement to it and that caught my eye right away. Thanks for sharing!